By Rudolph Hering, C.E., Member of the Club. from a Xerox copy, then reassembled in Adobe Photoshop. POLLUTION OF THE DELAWARE AND SCHUYLKILL RIVERS. It is generally believed that our drinking water, which is obtained from both rivers, is, at times, not of a very wholesome quality. Chemical analyses have frequently been made of samples taken at different times and places which partially confirm this belief. The difficulty of selecting fair and average samples suggests an inquiry from a different direction, namely, ascertaining the actual amount of sewage conveyed to the rivers.The absence of specific data and observations necessary for this purpose permits only of very rough approximations, but the results seem to be indicated sufficiently true for general conclusions. It is still an undecided question as to whether river water used for drinking should be kept free from even an insignificant amount of sewage; whether there is a standard which denotes how much organic or other matter may reasonably be allowed in it; and to what extent and how soon river water purifies itself during its course. 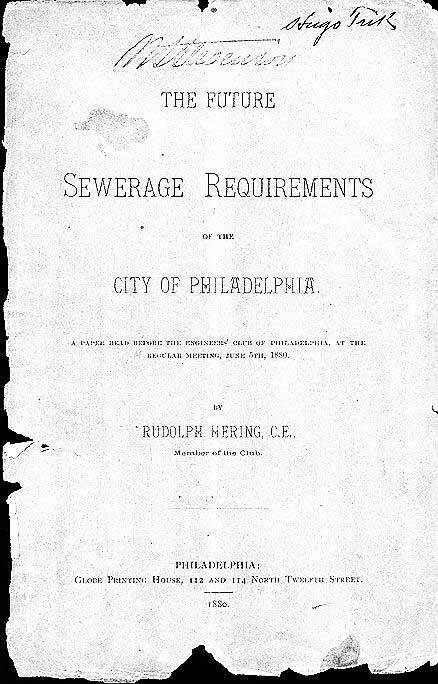 [Page 2] Without going into the merits of the different opinions, which would lead very far, we will assume that water flowing within the limits of our city cannot purify itself, and that water which has been slightly polluted may yet not be objectionable, as in the case of our Schuylkill water, which was five years ago pronounced by experts* [in the Report on the Water Supply of Philadelphia by a Commission of Engineers, 1875] as being "about as good a water as we might wish to find for a large city," although it received sewage from many places within five miles of the pumping stations. Any germs of diseases entering and living in the river water cannot, of course, be destroyed by dilution: the probability of infection only is lessened. As these germs may be assumed to occur along with other organic matter, the amount of the latter can generally be considered as indicating the degree of pollution. We have then to consider what maximum amount of sewage can be allowed in drinking water. Here, too, there is much disagreement, on account of the varied conditions, and we will again assume, for purposes of calculation, that the greatest amount permissible is 3 parts of organic refuse in 100,000 parts of water, by weight. Human discharges have been estimated to average from 2 to 2.8 pounds per day, and the waste from all other sources, as kitchens, stables, streets, slaughter houses, etc., as having about the same weight per head of population. We will therefore estimate the total sewage to be 5 pounds per inhabitant per day. The report of the Philadelphia Water Department gives the number of water-closets in the city as about 33,000. Not all of them discharge into sewers, and a number of houses have more than one, but it can be estimated that at least three-fourths of the number given in the report will represent the number of houses with water-closets discharging their entire sewage into sewers, which for the whole city is about 25,000 buildings. From records of the Board of Health, it is estimated that about 12,000 houses having cesspools but no water-closets, are connected with sewers. It is further estimated that very nearly one-third of all sewer connections are for general waste water, excluding water-closets or cesspools; which, as we have seen, is equivalent to one-half the number discharging the entire sewage. There are also about 4,500 street inlets which, through gutters, receive the waste water of many houses not directly connected, and, finally, we have the streams, which are often little better than sewers themselves. In order to divide this amount over the Delaware and Schuylkill drainage areas, it will be near enough to consider the quantity of sewage to vary as the number of water-closets. Although this is not true for the wards alone, yet for the larger areas the errors will be almost eliminated. The Water Department Reports, giving the number of closets for every ward, enables this division to be made. Multiplying this number for each ward by a coefficient, which reduces it to the number of persons draining into the sewers, marking the products upon the population map, and proportionately dividing the wards which cover several districts, we can then estimate the proportion of sewage which is discharged into the Schuylkill, above and below the dam, and into the Delaware. This coefficient being 290,000, divided by 33,000 = 8.8; the number of persons draining into the Fairmount pool is found to [Page 4] be about 3,000; into the Schuylkill below the dam about 119,500; and into the Delaware about 167,500. The first amount, however, requires a very material correction. The proportion of water-closets draining into the river is less than in other sections of the river, but the refuse from the slaughter houses and the large number of mills situated along the river, at or near Manayunk, is much above the average allowance per head of population. From a report by Mr. J.E. Estabrook to the Park Commission, we may conclude that the daily discharge from these mills, in the shape of bleaching and dyeing waste, animal fat from woolwashings, the evacuations of the workmen engaged in the mills, etc., will equal the contaminations from at least 5,000 persons in addition to the 3,000 given before. We will therefore estimate the sewage from 8,000 persons as discharging into the river above the dam. The minimum daily flow of the Schuylkill river is recorded as being less than 30,000,000 cubic feet, and lasting for over a month. Supposing one-half of all the sewage to be discharged in eight hours, the river during the same time delivering 10,000,000 cubic feet weighing 623,000,000 pounds, then if the sewage is uniformly distributed in the water, which is generally not even the case, it would require the refuse of less than 7,500 persons to pollute the water above the dam up to our assumed standard during the lowest stage of the water. We have just found that about 8,000 persons drain into it, showing that a pollution is probable. No drinking water being drained from below the dam, the condition of the lower Schuylkill is not a serious question for many years to come. The minimum daily flow of the Delaware at the head of tide is recorded as being 173,300,000 cubic feet, which would represent the amount of water daily pushing seaward in front of the city during a long drought. As it takes from twenty to thirty days for this quantity to pass through the distance which the river flows at one tide, and supposing that the daily discharge of sewage is sufficient to contaminate this daily addition of pure water, then we may assume that if the drought lasts about a month, the entire body of water passing the city will have become polluted. The fact that the sewage does not commingle [Page 5] uniformly with the river water in the short distance of our city front, but remains in greater abundance near the shore; tends to make this time even shorter. If the daily sewage is discharged into the Delaware evenly during twenty-four hours of a day, we find that a population of 65,000 would pollute its water to our standard in twenty or thirty days of drought. The entire population living on the Delaware slope is 553,000, but as we have seen, the sewage of only about 167,500 persons is conveyed into the river. Therefore, less than two-fifths of this number, neglecting the not inconsiderable refuse from the ships, would, if our premises are sufficiently accurate, cause the Delaware water to become unwholesome at certain times. First. That after a protracted drought, both the Delaware water and the Fairmount pool may be injuriously polluted. Secondly. That the former may be more impure than the latter, which goes to confirm the chemical analysis of Booth and Garrett, who give a larger proportion of organic matter per gallon for the Delaware water. It consequently seems evident that an increased discharge of sewage into the latter, as long as it is pumped for drinking purposes in Philadelphia and Camden, should be looked upon as being at least as objectionable as an increase into Fairmount pool. Discharging sewage into tidal rivers, whose water is used for drinking, is generally unsatisfactory, because the periods of slackwater--with us about fifteen minutes--permit much of the sewage to sink, and having reached a depth where the current is at all times weak, especially along the shore and in the docks, to deposit permanently or to be stirred up all at once during heavy tides or freshets. By way of parenthesis, it may be interesting to note in connection with this subject, what a small percentage of our population has made use of the water carriage system. There are about 150,000 houses in the city and only 33,100 water-closets. The Board of Health estimates in all about 70,000 wells or cesspools, about 50,000 of which are not connected with the sewers. We may safely say, that in the improved sections of the city nearly 500,000 persons make no use of underground drainage, but store [Page 6] up their faeces in privy wells, which are cleaned only when they are full, after saturating the surrounding earth with the liquid. To form an idea of the magnitude of this pollution of the soil, let us consider that about 10,000 permits are yearly taken out for cleaning wells, which, averaging less than 200 cubic feet, gives a gross quantity of filth removed of less than 2,000,000 cubic feet. As one person discharges one cubic foot in twenty days; or at least eighteen cubic feet per year; 500,000 will discharge 9,000,000 cubic feet. Therefore, at least 7,000,000 cubic feet drain yearly into the soil beneath our habitations. This is neglecting the soakage of the cesspools having overflows into the sewers, and also the kitchen water which is frequently turned into them. The amount of sewage as thus estimated to discharge into the Fairmount pool and the Delaware river, although based upon data which closer study and observations will modify somewhat, nevertheless sufficiently confirms the fact that our drinking water will at no distant day, if not already, require protection from further pollution. This is most effectually accomplished by intercepting sewers, which collect and dispose of the sewage in a less injurious way. The system proposed by Mr. Darrach has been advocated with this end in view. In discussing the same we should inquire into the requisites for a complete solution of the sewerage problem for our city. In doing so, I will give the outlines of another system, which appears to be better adapted to our future wants, and conclude with a comparison of the two. A design for a system of sewerage for Philadelphia, which will not only answer for the present, but form an integral part of an the necessary extensions of the future, and demand no outlay of capital more than is required to meet the wants of the generation paying for it, is somewhat complicated by the facts, that the country is broken by the Schuylkill river and several large creeks; that many independent systems have already been built, and that the area is very extensive, being even larger than London. The method pursued heretofore has been to treat each natural drainage area by itself, and allow the entire discharge to be at [Page 7] or near the lowest point. The same policy has been followed in almost every city at some stage of its development, and is a perfectly natural and necessary one in order to discharge the storm waters. Were it not that the gradual increase of population, and therefore of sewerage eventually begins to seriously pollute the rivers, it would also be the only correct system to pursue. As soon as the pollution becomes an evil, all sewage must then be intercepted before it reaches the river, and carried to some other locality, where it naturally is or can be made uninjurious, leaving the storm water alone to follow the old mains directly into the river. Where it becomes evident that a city will grow to such proportions, it is then a matter of economy to inquire into this ultimate disposition of its waste water; for slight modifications in alignment and grade of the ordinary or storm water sewers as they gradually become necessary, may enable them to be joined in with the final intercepting sewers at a small or no extra expense, whereas, if these are completely ignored, extensive reconstructions may be necessary. We have seen that in the near future it will be imperative to construct a few intercepting sewers, and, as these should necessarily form branches of the entire system, it is clear that we have arrived at the time when the question for the final disposition of our sewage is not premature. If economy in our municipal management is an object to be sought, it will be necessary to build these first sections so that they will answer the ultimate requirements as well as the present. In order to design a system which will effectually remove all the city's sewage, it is first necessary to consider: Where should the final outfall be located? Whether the sewage is turned into the Delaware during the first few hours of ebb-tide or utilized by irrigation or otherwise, does not matter at present; but one fact is certain, i.e., the point of discharge must be so far distant from the city that the sewage will not return to its docks, or that the winds will not carry noxious odors from sewage reservoirs or farms back to its houses. To answer this question we must inquire into the natural limits of growth of our city. The improvements of the southern portion are extending southward slowly but steadily. The Navy [Page 8] Yard and the shipping interests along both rivers will gradually draw the city in that direction, especially when this section is made more healthy by proper grading and draining, and when the navigation facilities of the Delaware will have been perfected. The most rapid growth will be towards the higher grounds of the north and north-west, and will also extend, but more slowly, north-eastward along the Delaware. The centre of activity will be near Broad and Market streets: the business section extending towards the Delaware and the Schuylkill and southward, the dwellings spreading towards and over the elevated country running north-east of and parallel with the Delaware river, from Darby to Fox Chase. A final disposition above the mouth of the Schuylkill, say at Greenwich Point, permits the sewage to pollute the river along the docks below, including the Navy Yard; a sewage farm or other mode of purification would become a nuisance, if not entirely impossible; a permanent reservoir would be more or less offensive, and, unless it is built large enough to hold at least an hour's sewage more than would be necessary at a point below the mouth of the Schuylkill, the sewage would flow up the latter river during every flood-tide nearly as far as Point Breeze. Until the lower section of the city is built up near the river, and the quantity of sewage is not too great, a temporary discharge, however, in this locality is economical and may be advisable. But an ultimate outfall for the Philadelphia sewage should be situated on the Delaware below the mouth of the Schuylkill, somewhere near Hog Island. This site will be remote without being too distant from any part of the city likely to be built up; and by constructing a reservoir from which the sewage can be discharged only during the first two hours of ebb-tide, none could ever return to any part of the city. There is likewise ample room, should it be required, for irrigation or other modes of utilization that may be found expedient in the future. No other point seems to combine these advantages. Granted, then, that this is the best locality for a final disposal of our sewage, the next question is: How can all the sewage be brought to it with the least delay of time and the least expense? [Page 9] The latter can evidently be achieved only if gravity is resorted to as much as possible, and the amount requiring pumping is reduced to a minimum. The former is obtained by having a good grade and running the shortest available course. In order that the greatest possible amount of sewage can reach the outfall by gravity, it must be collected by a high level intercepting sewer, beginning at the necessary elevation, to permit storage in the reservoir, running upwards at a grade sufficient to produce the required velocity, and branching off into all the valleys until it has traversed the entire city. Its general alignment would be about as indicated on the map. The general route is quite direct, and excepting the short section through the built up part of the city, has but few bends. Nothing short of a detailed study, which, however, would not materially alter its course, can designate the particular streets upon which it could be most economically built. This sewer receives all the drainage of West Philadelphia, excepting a narrow strip along the river, probably never requiring interception. It crosses the river Schuylkill just below Fairmount, runs into the city up to about Thirteenth and Spring Garden streets, and thence out to Frankford, etc., intercepting. the area north-west of its line. There are no difficulties in the way of this construction. The grades of a few streets would require adjustment, but as they are at present mostly unimproved, this could be easily accomplished if done soon enough. The Schuylkill can be crossed by means of a pipe bridge giving the same clear headway as the Fairmount bridge. Tacony creek could be crossed the same way at an elevation of about thirty feet above the water. Its fall is estimated at grades sufficient to give a velocity of from four to six feet per second, therefore discharging the sewage from Chestnut Hill and Frankford in less than five hours. 1. At Seventieth street a branch from Paschallville taking the sewage from the Cobb's creek drainage area. 2. At Fairmount a branch on the western bank of the Schuylkill, running towards the Zoological Gardens, intercepting the drainage of the Mantua creek sewer. 3. At Twenty-third and Spring Garden streets the drainage already intercepted from the eastern shore of the Schuylkill by the Pennsylvania avenue sewer. 4. Near Tenth and Diamond streets the Chestnut Hill branch, which as long as it remains in the Cohocksink drainage district can be identical with the flood water main sewer, and then with a heavy grade rising to near the top of the abrupt descent into the Wissahickon valley; it skirts the latter up to Chestnut Hill. 5. Near Second and Ontario streets the Wingohocking branch, extending northward to intercept the sewage brought down by the Wingohocking creek. Thus all localities of the city from which the sewage can be removed by gravity are reached. The only exception is the high ground between the Wissahickon creek and the Schuylkill, which, if it ever requires relief, may be connected with the Chestnut Hill branch by means of a pipe bridge near the mouth of the creek. The remaining sections of the city, situated below this high level sewer, ultimately require pumping. These are the territories draining into the Schuylkill from its eastern shore, below the dam and into the Delaware. To intercept them will require a sewer near the eastern bank of the Schuylkill, and another along the western shore of the Delaware. To reach the ultimate outfall they must unite somewhere near Girard Point, cross the Schuylkill by an inverted syphon similar to, though not so extensive, as the one now being built for the disposal of the Boston sewage across the bay, and then lead to Hog Island. The pumps should be on the eastern shore of the Schuylkill, the sewage flowing by gravity on the other side. To find the most expedient elevation which will drain the greatest amount of sewage with the least pumping, it is necessary to know the heights at which all the sewage will be collectable. An examination of these shows that the elevation of -15.0 or 6-1/2 feet below low water seems to be about the highest level to which it is practicable to bring the sewage at Girard Point. Assuming the surface of the reservoir to be +5.0 and allowing five feet fall to it from the pumps, it requires a lift of not over thirty feet. Considering that the Boston sewage will be lifted thirty-five feet, [Page 11] and the London sewage at Abbey Mills is pumped thirty-six feet, we are comparatively well situated. Starting with this elevation at Girard Point and running up along the Schuylkill at a grade of 1: 2000, we intercept all the sewage flowing into it with a very little readjusting of the lowest existing sewers. The only troublesome point is at Arch street, but here it will be much cheaper to reconstruct a large part of the sewer on this street than to lower the entire intercepting sewer and add to the permanent lift. At Fairmount the sewerage level can be as large as + 3.0, and at Manayunk, six miles above, increasing the grade to three feet per mile as low as + 21.0, which is three feet below the bottom of the canal. Starting again at Girard Point with + 15.0, crossing over to Greenwich Point, thence up Front to Tasker, up Second to Poplar, etc., to Gunner's Run, as indicated, we can intercept all the sewage except from the Dock and Willow streets' sewers, both of which, however, can be readily adjusted. The grade is estimated at 1: 2000 up to Snyder avenue, 1: 1700 to Laurel street, and 1: 1500 to Gunner's Run, etc. The section from Snyder avenue to Gunner's Run intercepts nearly all the sewage polluting the Delaware. The districts not drained are the 16th, half the 17th, the 18th and 31st Wards (where water closets are comparatively scarce), and the Tacony creek basin. The area, therefore, requiring an eventual lift of thirty feet covers all the low territory along the Schuylkill and the greater part of the populated portions along the Delaware. Lastly, there is a district which is so low and distant from the outfall that an additional lift must be resorted to. This area is situated north of Poplar street and between the sewer just described and the river, extending to Torresdale. The sewer relieving this territory must have its lowest point near Front and Laurel streets, where pumps could lift the sewage about fifteen feet into the Second street intercepting sewer. The entire system is thus completed. Each natural valley or drainage area must have its own independent sewerage as built heretofore, to discharge the storm water as directly as possible into the rivers; but on its course each main is relieved of the [Page 12] sewage proper from as many places as is consistent with the most economical way of final disposition, as we have seen, leaving the rain water alone by properly constructed overflows to continue its present course. It now becomes necessary to examine into the order in which the various parts of this system will be required. The section from Manayunk to Fairmount is evidently the first one needed, in order to maintain the purity of over four-fifths of our drinking water. It has been proposed for many years, and urged again by the Commission of Engineers, in their Report, 1875, who suggest that it may either be used as a sewer or as a conduit for pure water from Flatrock pool leading to the pumps at Belmont, Spring Garden and Fairmount. In either case it could eventually be joined in the above systems for ultimate disposal. This branch needs no pumping.at present, as it discharges above mean high water. The cost of construction will not be more than $700,000. The next section which will become necessary is the sewer from Gunner's Run to Snyder avenue, cutting off nearly all the sewage flowing into the Delaware. A simple gravity discharge is of no avail, because in order to collect the sewage it would be situated too low. Pumping with constant discharge below the city is also not sufficient, as the sewage would return with the flood tide to where it was collected. It will, therefore, be necessary to have a reservoir so that the sewage may be retained until the tide goes out. Evidently it cannot be economical at this time to construct the final outfall works. But until the lower part of the city is built up, a temporary reservoir and discharge below Snyder avenue seems to be the most economical solution of the problem. The offensiveness from a reservoir of about three acres in which sewage is replaced at every tide, and not left to decompose for days and weeks, as it does on the flats, will not be near as great as from the bone boiling establishments now located in that neighborhood. The expense of the reservoir would be comparatively slight, owing to the very suitable quality of the soil. The lift is about fourteen feet. The entire expense of construction, including reservoir and pumps, would not exceed $1,100,000. These two sections probably suffice for the needs of the present [Page 13] generation. When the condition of the Schuylkill below the dam becomes offensive, the entire West Philadelphia drainage might then be intercepted by the lower section of the high level collector and one compartment of the reservoir near Hog Island built, thus temporarily relieving the river of a large extent. 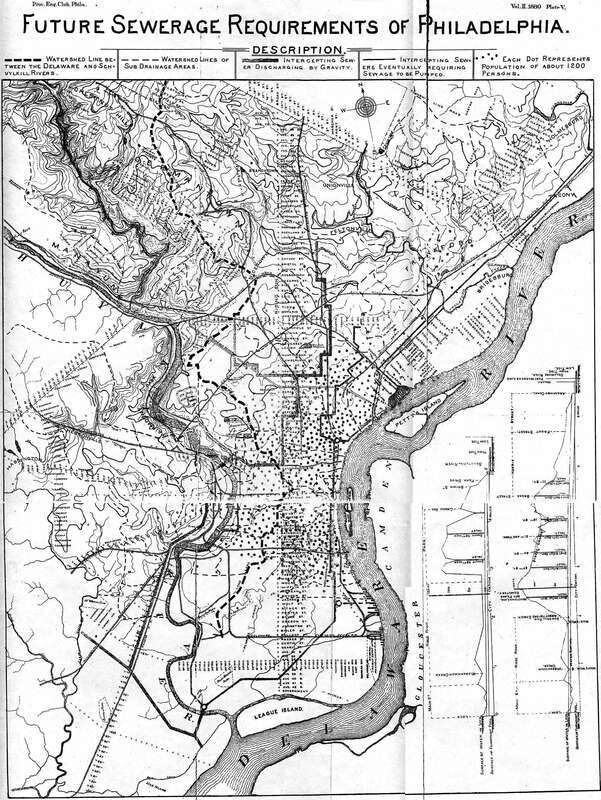 When the Delaware again requires protection, the low level sewer starting at Laurel street would furnish relief, and then the extension of the high level collector beyond Fairmount, some branches of which may have been required and built before, and finally the completion of the low level sewers from Fairmount and Snyder avenue to Girard Point and the outfall. At some previous time it may be found expedient to temporarily dispose of the sewage now draining into the Wissahickon creek and thence into the Schuylkill, by irrigation or other method, before it reaches the creek, until the population becomes too great, the high level collector having not yet been built. In this way the total expense is divided over a long term of years, and each generation will be required to pay very little more than for its own immediate wants. Having thus sketched a complete system, which appears to answer the present and all future demands, it remains to compare it with the one recommended by Mr. Darrach. His "first district," which is West Philadelphia, is provided with a sewer running parallel to the Schuylkill and emptying into Darby creek. It is of less size than ours as it does not drain any territory east of the river. There is, however, a serious objection to discharging into Darby creek, as the sewage will not flow away rapidly in an irregular channel, but deposit in the eddies, along the banks, and otherwise be a nuisance to the country through which it flows. If the sewer is to discharge by gravity it would have to be higher, and therefore intercept less territory. The "second district" comprises the eastern slope of the Schuylkill valley and the Delaware slope south of Norris street. The main feature is a sewer running diagonally across the city from the Falls to Broad and Norris street, and thence along Norris street to the river, as indicated by a black double line on the map. But ultimately it is to be carried down Second street to Greenwich Point, which is the outfall for the system. Another sewer intercepts [Page 14] the Schuylkill shore below Fairmount and crosses over to the same outfall. The diagonal sewer is intended to relieve the Fairmount pool, and is, as we have seen, the first one needed. An essential and important difference between the two systems therefore, is the location of this sewer, whether it should discharge at Fairmount below the dam or at Norris street into the Delaware. The former is a mile shorter, with much less tunneling, as will be seen by comparing the profiles on the map. Yet would the latter offer sufficient advantages to compensate for this greater length and cost? The fact that no water is pumped from the Schuylkill below the dam, but nearly one-fifth of our drinking water is obtained from the Delaware, seems strongly to negative the advantage of this line. The Delaware works are situated quite near the proposed outlet, the Camden pumps are opposite, and the Frankford works six miles above it. As the tide runs up over five hours during low water season, and at a velocity of over two miles an hour, there is already a strong probability of the works pumping polluted water during a drought, as we have seen. To increase this pollution by sewage, which could as well be turned into the Schuylkill, where it is not pumped, seems therefore not advisable. It is suggested that this sewer may at the same time be used to convey away the storm water from the district through which it passes and thus save expense. This necessarily increases its size materially, which, together with the fact that nearly the entire length of the main sewer in that district has already been built, would not make it economical. Another objection to the diagonal sewer lies in the fact that for two miles it runs under private property, unless a street could be laid out from Broad and Norris to the Falls. When it becomes necessary to abandon the outfall at Greenwich Point and discharge the sewage below the mouth of the Schuylkill, then this diagonal sewer, which should form a part of an ultimate system, would cause the sewage from above the Falls to flow two miles further than if brought down along the eastern shore of the Schuylkill, consuming more time, and with a grade of, say only 1: 2000, necessitating a permanent increase of pumpage [Page 15] of five feet over the shorter route, or the interception of less territory. The sewage from the Falls and Manayunk already reaches the lower Schuylkill, except what is pumped in the drinking water; the construction of the sewer can, therefore, not increase its pollution. On the other hand, keeping the refuse of about 8000 persons above the dam out of the river below it, which receives that of about 119,500 persons, could not be appreciated. It seems, therefore, that both for the present and future the discharge of the Manayunk drainage into the Schuylkill below the dam, is preferable on grounds of efficiency as well as economy. The sewer down Second street is substantially the same as on the map, but to carry the sewage from the diagonal sewer without additional pumping near Laurel street, would require it to be laid deeper. The section on the eastern shore of the Schuylkill, in running across to Greenwich Point, allows the sewage to flow down the Delaware and with return tide much of it will again enter and flow up the Schuylkill. The "third district" of Mr. Darrach's system is substantially the same as the section above Laurel street and is similarly treated. A disposal by gravity has not been proposed by him, and its necessity will indeed not appear for many years, as it intercepts at present only thinly populated districts. Only the upper Schuylkill sewage can now be removed without pumping. But it nevertheless is well to consider what gravity can eventually do in connection with a complete system, so that the proper authorities may rereserve certain lands, adjust certain streets and lay others upon the city plan in good time, and build all ordinary sewers needed before, which have to cross the intercepting sewers, in a manner that will finally form effective and economical parts of the whole system.